I wasn't going to do any baking today, because we had cake last night and I just didn't want any more sweets beckoning for me to come and eat them and gain lots of unwanted weight. My motives were pure. But the temptation was too strong. I remembered these delicious cookies that I made with my family last year (in my pre-blogging days) and felt nostalgic and reminiscent. And I wanted to make them again. So I did. The obligatory gingerbread boys and girls. Preheat the oven to 350 degrees. On a lightly floured surface, roll the dough out to 1/4 inch thickness (mine always end up being rolled thinner than this). 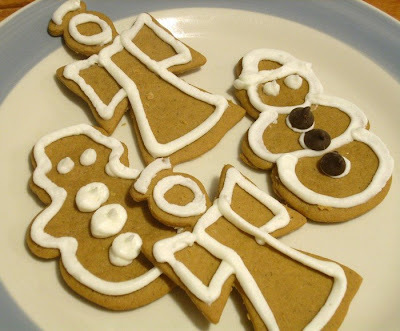 Cut into desired shapes with cookie cutters. Place cookies 2 inches apart on ungreased cookie sheets. Bake for 8 to 10 minutes in the preheated oven, until firm (with how thin I roll them, I only cooked them for 6 minutes). Remove from cookie sheets to cool on wire racks. Frost or decorate when cool. I used my favorite frosting recipe to decorate these cookies, plus a few little things I had lying around - chocolate chips, green sugar, chocolate sprinkles, and cinnamon red hots. Cute little angels and snowmen. In a medium bowl, cream together the butter, confectioners' sugar, and milk until light and fluffy, about 3 to 4 minutes. Beat in the vanilla and food coloring. Spread on or between cookies. The bells were a good excuse to use lots of delicious frosting. These cookies, depending on how thin they're rolled and how long they're baked, can be soft or crispy. Most of mine turned out more on the crispy side, like gingersnaps. With the sweetness of the frosting rounding out the spiciness of the cookies, you have a delicious flavor combination! The cookies were fun to make, and fun to eat. The trees were my favorite - so pretty! 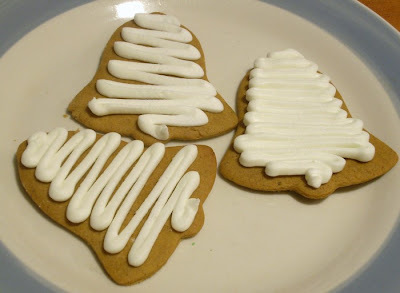 I love gingerbread....and haven't made any this year!!! Your cookies look so sweet...I love the angels! These are so cute :), I bet they're yummy too! Those look awesome! Great pictures!!! 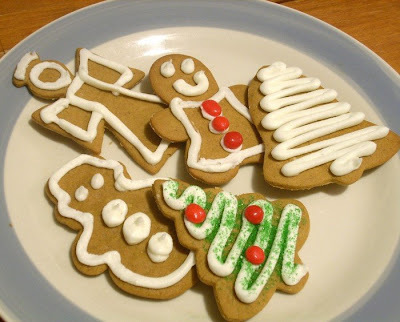 I love gingerbread cookies. 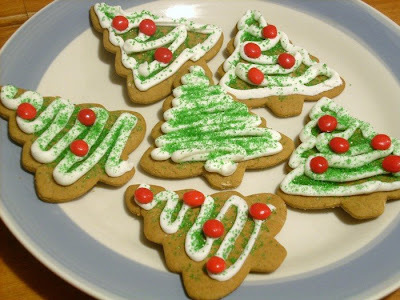 Your cookies look delish and so cute! Love them! my moms reciepe is different and oh so yummy. i made some houses this year to sell ill post on the blog later!! So cute! I especially like the Christmas trees. Very festive! Glad your temptation won out. I made this recipe over the weekend and they are delicious. 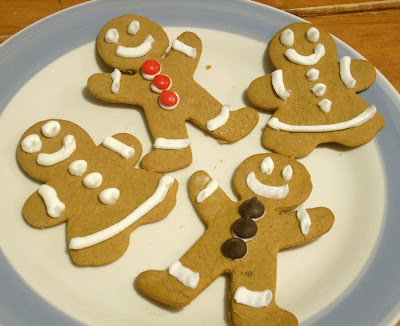 I've never been a big gingerbread fan, but I really like them. So, easy to make also! I just love the way you decorated the trees! I aspire to make mine look so good next year. Our New Year's Eve Treats! So Last Minute - Gift Mixes!